Word arrived today that the owner and crew of Crescent motor yacht OLGA are keen to secure a Caribbean yacht charter reservation during the upcoming St. Lucia Jazz Festival, April 30 – May 12. The popular mega yacht charter vessel is waiving all delivery fees to be in position in the islands of the Grenadines to accept bookings between April 26 and May 25.Take advantage of this opportunity to discover St. Lucia and the Grenadines. Caribbean activities include scuba diving, hiking, zip-lining, biking, and horseback riding. Then, for a touch of tranquility, take advantage of the amenities in place at several world renowned spas, resorts, and wellness centers in the Grenadines.Editor’s note – come to think of it, there’s little reason to spend extra money visiting a spa, since Crescent yacht OLGA, ex BARONESS, has a warm Jacuzzi tub on her deck and a licensed massage therapist in the crew!!! Motor Vessel MV OLGA, ex BARONESS offers accommodations for 8 guests in 5 staterooms. The multilingual (English, French, Spanish, and Thai) and multi-talented crew includes Captain Bernard Calot, Chef Philippe Le Scelleur, Mate David McCoy, Chief Stewardess/Masseuse Sarah Herrera, Stewardess/Masseuse Jiwan Kongtup, and Deckhand Patricio Ramirez. Oops – we almost forgot to mention the St. Lucia Jazz Festival!!! Considered the Caribbean’s premier cultural event, the Saint Lucia Jazz & Arts Festival will attract thousands to St Lucia. Cultural enthusiasts, festival lovers, and music aficionados will be wooed by over 50 world-acclaimed entertainers and artisans over the 13-day festival, which runs from April 30 to May 12, 2013. The 82.50 meter motor yacht O’MEGA, one of the very few private luxury yacht charter vessels in the world with the capacity for over 12 guests, is heading to the Caribbean for the very first time this winter. 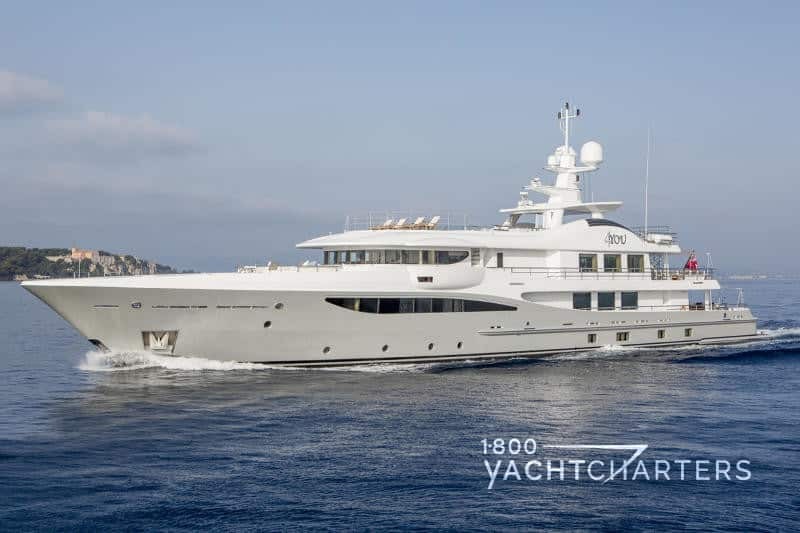 Re-launched in 2004 after a complete remodel from a near-bare hull, super yacht O’MEGA underwent a major refit in 2009, and has had continuous upgrades every year since. With an excellent crew-to-guest ratio, there are 30 crewmembers onboard to attend to 28 guests in 14 guest staterooms. While in the Caribbean from early December, 2016 through April 2017, her weekly charter rate is €525,000 + running expenses. There is a two week minimum fee for charters during Christmas and New Year’s Eve. 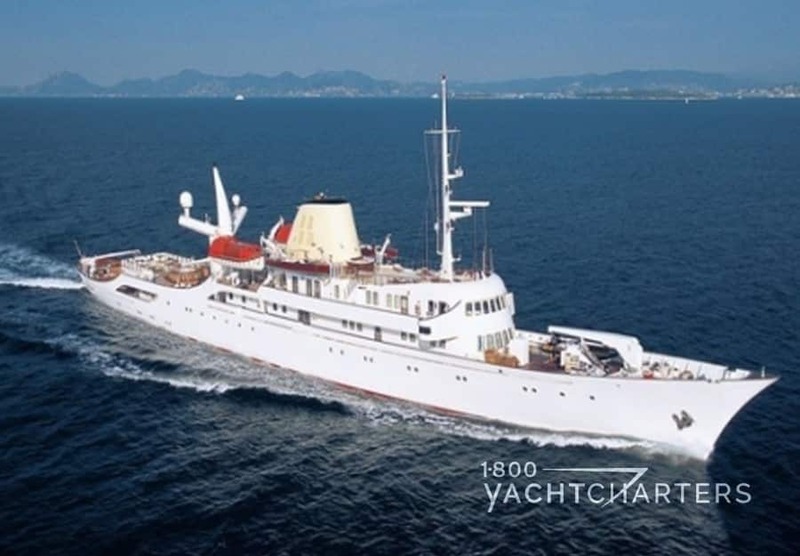 The only other +12 passenger superyacht considering relocation to the Caribbean for the winter is the 36 passenger motor yacht CHRISTINA O, as her owner has expressed interest in the emerging Cuba yacht charter marketplace (now that travel restrictions between the governments of the United States and Cuba have been eased). With so few large-capacity yachts in the Caribbean this winter, we expect strong demand for both of these vessels in the area of St. Martin, particularly for St Barts yacht charter clients who invade the small island to celebrate the New Year. The 28 meter sailing yacht WHIRLWIND has joined the growing list of sailboats heading to the Caribbean for the winter and spring seasons, and is offering reduced rates to entice vacationers. is the ultimate Virgin Islands yacht charter sailboat for family of 6 to 8, with generous accommodations available in 3 guest staterooms. The sailing yacht offers three double cabins, two with a Pullman berth (thus the yacht can accommodate 6 adults + max 2 kids). One double cabin is located forward port side, and two identical cabins are positioned aft at either side of upper saloon stairway. Each cabin is equipped with its own en-suite bathroom and shower. Onboard amenities include a Crestron–controlled multi-media entertainment system, a PlayStation game station for the kids, and iPod docking stations throughout the yacht. Launched in 1988 by the fabled Holland Jachtbouw shipyard, the yacht features the classic styling of interior designer Andrew Winch who oversaw a major interior refit this year (2011). The yacht is available for the year-end holidays at a rate of € 32,760 per week. At the conclusion of the holidays, special winter and spring rates will take effect, with the price dropping to € 19,950 per week (regular winter/spring rate is € 26,600 per week). All rates are plus expenses. A Caribbean yacht charter vacation is a great way to kick the blues. Now, a popular sailing charter yacht wants to help you sing the blues! 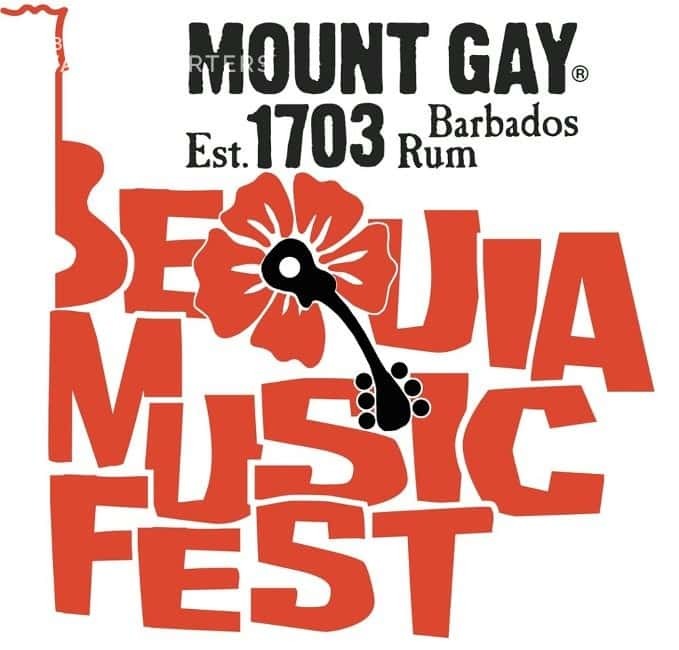 Book sail yacht MAKAYABELLA during the Bequia Mount Gay Music Festival (January 26th – 29th, 2012). 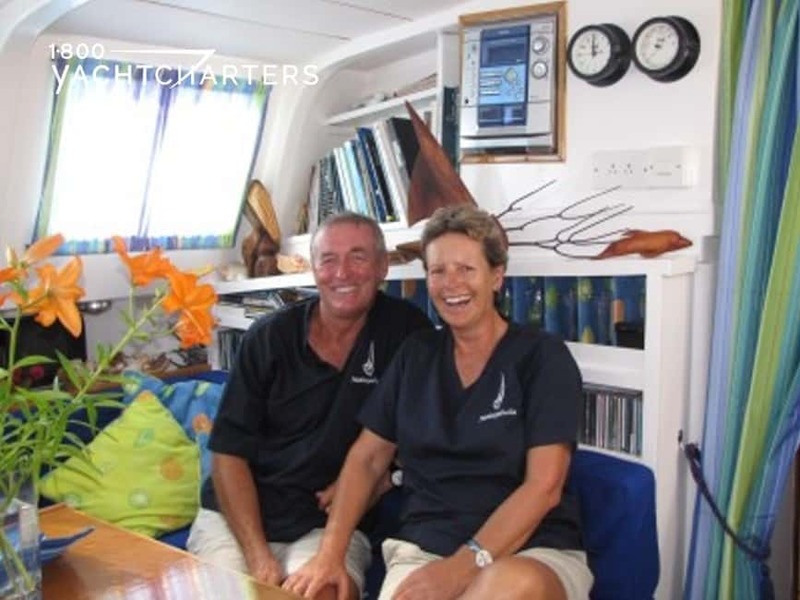 The yacht’s crew, John and Sue, provide the guests with multiple items. For instance, complimentary tickets to BOTH the Friday and Saturday night performances. Outstanding performances by local, regional and international artists has made this music festival one of the “must see” fixtures on the Caribbean season’s calendar. The event kicks off with Dana Gillespie and her London Blues Band’s performance on Friday night and lasts for four days. The festival has received rave reviews since its inception and precedes the 14-day Mustique Blues Festival. The main venue and stage is located at De Reef, right on the beach in Lower Bay, Bequia, with the big performances on Friday and Saturday night – followed by lazy Sunday afternoon “limin’” music to close out the weekend. The cozy sailboat MAKAYABELLA can accommodate 6 guests in 4 cabins. The Master cabin has a double bed, shower and toilet. 2 Guest cabins have a twin bed, shower and toilet. A Guest cabin has a double bed, shower and toilet. All cabins are ensuite. On warm evenings, the yacht offers air conditioning in the saloon. John and Sue have taken guests to this event for the last few years and they report everyone has a great time. If you’re a music lover and looking for a unique charter experience, plan a yachting holiday onboard sail yacht MAKAYABELLA around the festival’s dates, and John and Sue will throw in the tickets – free of charge. It’s hard to imagine any superyacht owner who is more passionate about the business of private luxury yacht charters than the owner of superyacht AXIOMA. Never content to sit back and quietly wait for inquiries, the owner of this award-winning yacht often contacts us with special promotional offers to entice affluent travelers to enjoy the superyacht experience first-hand. On the heels of the recent special year-end holiday prices, the owner has asked us to slash rates by 43% for select dates in May and September. Technically, the offer is 7 nights for the price of 4 – which equates to a 43% discount on the published rates. Motoryacht AXIOMA will remain available in the Caribbean through the month of May; thus, anyone interested in a week-long St Barts yacht charter vacation, for example, has the opportunity to pay for just 4 nights, yet enjoy the yacht and the destination for 7 nights. Can’t get away in May? Prefer to spend your vacation in the Mediterranean this summer? No Problem!! You can enjoy the same great deal on select dates in September. That’s right – come enjoy the Monaco yacht charter experience for 7 nights for the price of 4. Motoryacht AXIOMA is normally priced at €490,000 per week in May, and €595,000 per week in September. By taking advantage of this special, you’ll pay €280,000 per week in May or €340,000 per week in September – a savings of 43%. Regular visitors to our website and blog are familiar with the pedigree of yacht AXIOMA. 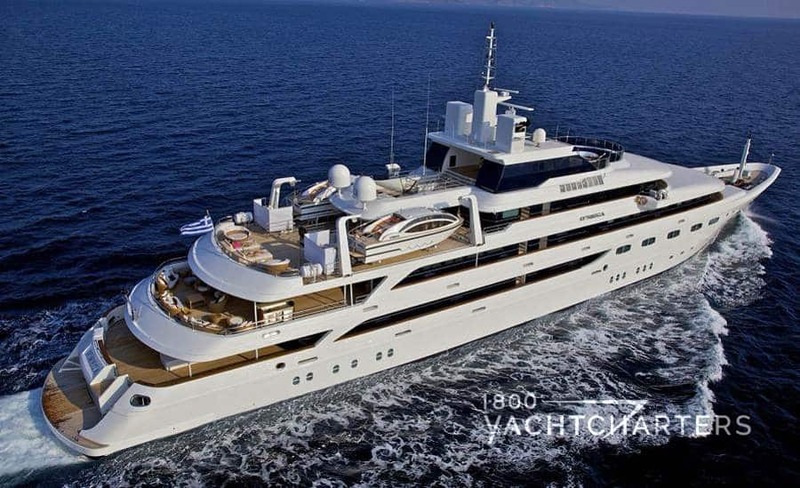 She’s the 2014 World Superyacht Award winner for Design Excellence. One of the world’s largest rent-a-yacht vessels in the market, guests will relax within the spacious confines of six decks, and 30,000 square meters of space. This yacht is ideal for 5 to 6 couples, with accommodations for a maximum 12 guests. Another superyacht owner has announced intentions to relocate his yacht to the Caribbean for the upcoming winter/spring season. The 82.4 meter (270’35”) Abeking and Rasmussen motoryacht RoMEA is scheduled to arrive in the Caribbean in early December, in time to participate in the winter 2016/spring 2017 St. Martin yacht charter season. 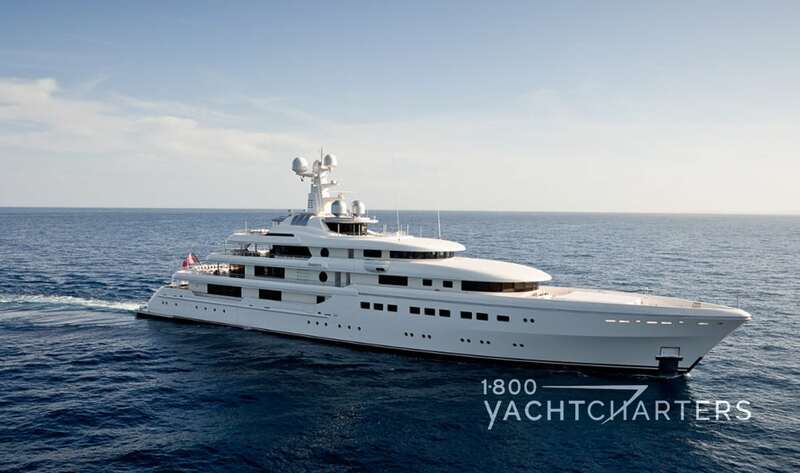 Built in 2015, the yacht spent her first year in charter service in the Mediterranean, and now joins a growing list of superyachts relocating to the Caribbean in December, including the 58 meter Benetti yacht ILLUSION V.
Currently ranked 84th on the list of the world’s largest yachts, yacht RoMEA offers accommodations for 12 charter guests in six staterooms. Part of a growing fleet of wellness yacht charter vessels that are best described as, “floating spas,” her onboard amenities include massage services, indoor and outdoor cinemas, and a beach club with steam room. Guests are encouraged to also use the yacht’s extensive watersports inventory including underwater sleds, windsurfers, stand up paddleboards, scuba gear (for certified divers), kayaks, and water skis. 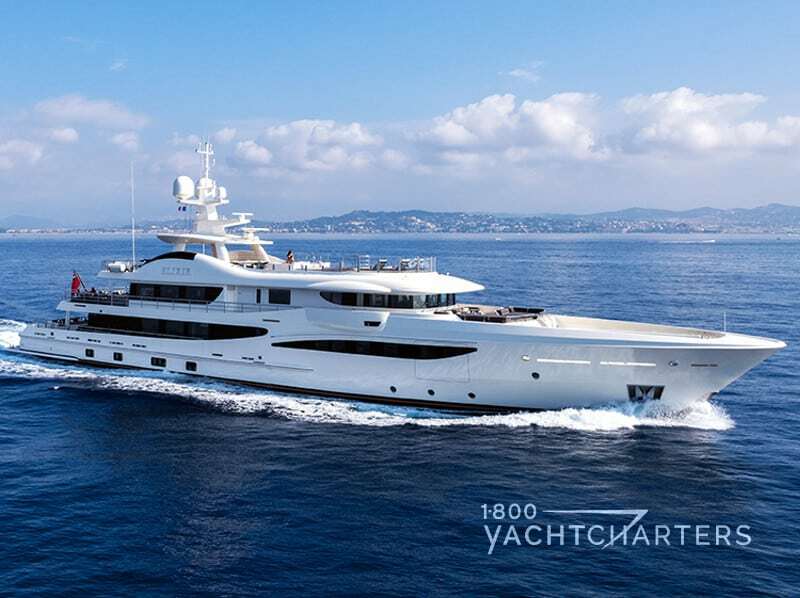 The published charter rate for ROMEA is €875,000 per week, plus running expenses. A One-Day Caribbean Yacht Charter Can Be Fun! While crewed sail boat charters and bareboat charter vacations normally last 5 to 7 nights, not everyone has the time for a multi-night term luxury yacht charter. In this economy, saving up for a special bareboat charter or luxury yacht charter holiday might mean postponing until 2010. Now for the good news – sailboat charters can be as short as one day and are the perfect compliment to a land-based Caribbean island vacation. There are four major inhabited islands in the BVI, as well as dozens of (nearly 60) smaller islands, cays, and rocks scattered throughout the archipelago. Of course, the fun way to see these sights is by boat on a luxury sailing charter. You can rent a small Caribbean yacht charter sailboat or a fast powerboat for the day in Road Town, Nanny Cay, West End, or several other locations. Some experience driving a powerboat or basic chart-reading skills are important to ensure you have a pleasurable day. A great trip could start from Road Town, Tortola and head south across the Sir Francis Drake Channel to Peter Island. You can tie up to the dock in Sprat Bay, or anchor off the beach in Deadman’s Bay and swim ashore (remember to wear your water socks). Visitors are welcome in the public areas, the boutique, and the beach grill. From Peter Island, it’s a short boat ride to Norman Island. This is author Robert Louis Stevenson’s legendary Treasure Island, and the source of countless tales of pirates and buried chests of gold. Today, the island is uninhabited except for a small restaurant on the beach in the Bight. Anchored in the bay is the old ship, William Thornton, affectionately known by bareboat charter lovers and the locals as the “Willy T,” a trading vessel converted to a bar and restaurant. It’s a great stop for a little “pirate” ambiance. Be warned – on holiday weekends, the Willy T is not appropriate for kids as it takes on a bawdy “adults only” atmosphere. Just outside the bay are the Caves. These are more like grottoes and are a true snorkeler’s delight. You can tie up your boat to one of the National Park moorings and swim in. Don’t be surprised if a school of tropical fish swim alongside you, looking for a handout. The locals ask that you resist the temptation to feed the little critters, however. Human food is not healthy for the fish and may do them great harm in the long run. If the sun is still high in the sky, and you still feel fresh for more adventure, zip over to Salt Island. You can tie up to the dock and walk around the abandoned houses to the salt pond where workers harvest and sell sea salt. If you still have any get-up-and-go in your tank, hop back on your boat and cruise around the corner to the wreck of the HMS Rhone, the BVI’s first underwater park. Snorkel over the wreck and try to imagine what it looked like before it sank in 1867! By now, you realize you are on “island time.” There’s little reason to hurry back to Tortola, unless you have an early dinner reservation at your hotel or resort. Assuming you are in the island groove, we suggest a cruise east to Cooper Island. Accessible only by boat, this island has a few rental homes and a tiny resort that’s looks like a vacation postcard from the water – palm trees and long, white sand beach. By now, you must be hungry from a morning/afternoon of exploring. Drop in a local restaurant for a late lunch. With a full belly and a big smile, it’s just a short sail or cruise back to Tortola. There are many other itineraries for a day trip by boat. Your hotel concierge can recommend the best local boat rental operators and give you some ideas as to where to go and what to see there. You can go fast on a powerboat or slower on a sailboat – the choice is yours. Either way, a day boat trip around the British Virgin Islands will be the highlight of your land-based island holiday! Thinking about a St Barts yacht charter this December on a comfortable, head-turning megayacht? If you are, we have great news. Two Amels Limited Editions 180 superyachts have just announced plans to head to the Caribbean this winter, and both will remain in the area through Spring 2017. Amels motor yacht ELIXIR and yacht 4YOU, Limited Editions 180 models will be available this December, 2016 through April, 2017 for British Virgin Island yacht charter reservations, or further south in the area of St. Martin and St Barts. Built in 2012, Amels yacht 4YOU features a stunning contemporary Laura Sessa interior and sleeps 10 to 12 in 6 guest cabins. The newer yacht ELIXIR, Amels 180 offers accommodations for 10 guests in 5 cabins, and also boats a Laura Sessa interior with a bit more eclectic look than 4YOU. It’s hard to beat the outright indulgence of a Virgin Islands crewed yacht charter – every detail is managed by a trained crew, from operating the yacht, to preparing your customized meals, to keeping the vessel tidy and shipshape. But what about those times you feel the need to escape – to be alone with loved ones – a chance to trade polite intrusiveness with no-frills quality family time? Families who routinely enjoy luxury yacht charter vacations with a full-crew compliment can now opt to go boating in total privacy, onboard a bareboat yacht charter. The concept is simple – just as you would rent a car to drive yourself, with some basic training, you can rent a bareboat and take the helm yourself! A, “bareboat” is just as the name sounds – a boat with just the bare essentials onboard. It comes to you with no food, no beverages, and most noticeably, no crew. You do your own cooking and cleaning, and you operate and sail the yacht, yourself. Fleets of bareboats can be found in nearly every location you would expect to find a fully-crewed yacht charter vessel. Virgin Islands bareboat vacations are perhaps the most common, with hundreds of boats available for rent in both St. Thomas, USVI, and Tortola, BVI. 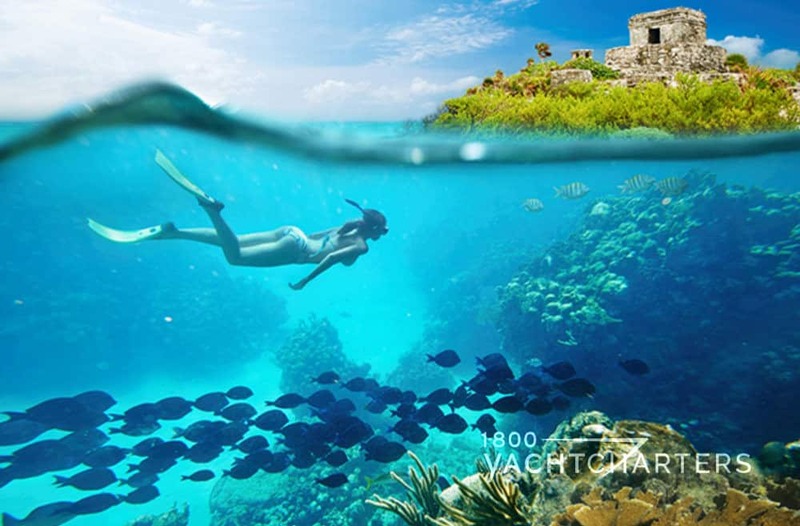 Other top-rated destinations include Bahamas bareboat vacations in the Abaco island chain, and Florida yacht charter holidays, primarily in the Florida Keys. Both sail yachts and motor yachts can be rented, with room for 2 to 8 passengers. A small handful of bareboat catamaran yachts can even accommodate up to 10 passengers. Companies such as 1-800-BAREBOAT, the Moorings, and Sunsail specialize in arranging self-skippered charters in destinations around the world; for example, Bahamas, Florida Keys, Greece, Corsica, Sardinia, France, Cote d’azur, Tortola, Tortolla, St. Thomas, Tahiti, Bora Bora, Tonga, Miami and South Florida. Customers can choose from a global network of monohull sailboats with brands like Beneteau, Sun Odyssey, Dufour, or Jeanneau – and multihull catamarans with brands like Fountaine Pajot, Lagoon, and Sunreef. Basic rental prices tend to be less much expensive than those of luxury crewed yacht charter vessels, but customers need to remember they are responsible to purchase and prepare their own meals. The cost to provision the yacht must be considered when comparing this bare bones charter option to the price of a crewed yacht. Another important factor – the customer’s qualification to operate a boat. Just as it takes skill and normally a license to operate a motor vehicle, similar rules apply to bareboats. While formal licenses are not usually necessary, a solid level of competency is necessary. The ability to read basic charts, navigate, and to set the anchor are the most important skills required to rent a bareboat. Luckily, these skills can easily be mastered, either through formal boating courses, or simply by garnering casual boating experience with your own boat or the boat of a friend or neighbor. Popular ideas for bareboat yacht charter vacations are anniversary celebrations, family reunions (with boats sailing in tandem), couples getaways, and snorkeling adventures. So before you plan your next tropical odyssey, give some thought and compare bareboat vacations to crewed charters – one of them will surely be the right choice for you, your family, and friends! Ready to become the master of your destiny, or at least your sailing journey? Taking the helm as the skipper of your own bareboat yacht charter is truly a rewarding experience for anyone who wants the challenge of guiding your own vessel in the world’s most exotic island destinations. 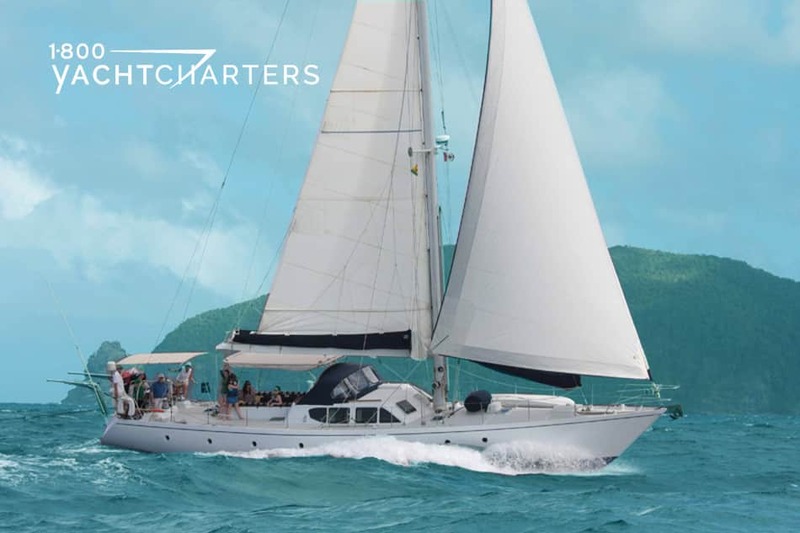 To charter a bareboat sailboat or powerboat, contact 1-800 Yacht Charters at https://www.1800yachtcharters.com/book-now-contact-us/ TODAY!